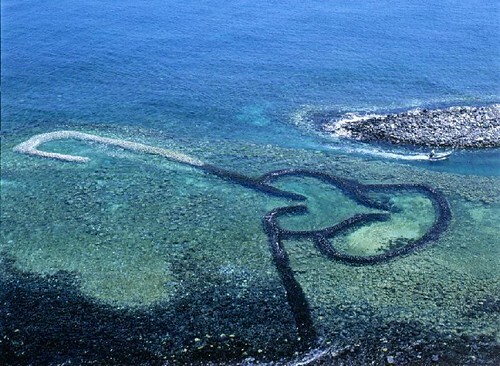 The "Twin Hearts of Stones" is an ancient weir used as a fish traps by the islanders of Cimei, in the Penghu archipelago of Taiwan. For centuries the local fishermen have been traditionally constructing weirs by means of stacked stones and have been using these to catch fish. High tide brings in fishes in the walled area and when the tide ebbs away, the fishes remain trapped in the weir and become an easy catch. There are many fish trap weirs in the archipelago. 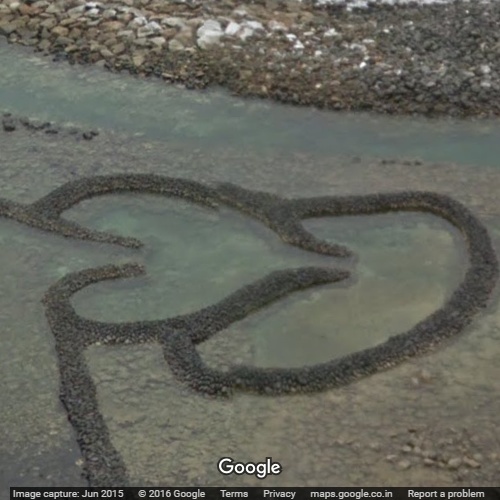 The stone weir at Cimei is coincidently in the shape of a pair of valentine hearts and due its shape, it has gradually become a big tourist attraction and sort of pilgrimage spot for lovers and newly weds who come to the island to see this symbol of love. An annual Stone Weir Festival is also held on the Island, which draws a large number of tourists.